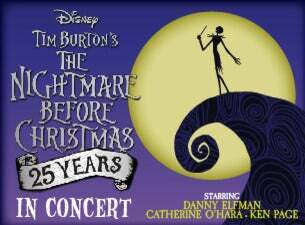 Elfman, performing his role of Jack Skellington, will be joined by other original cast members Catherine O'Hara as Sally, and Ken Page as the voice of Oogie Boogie with a full orchestral accompaniment by The Royal Scottish National Orchestra in Glasgow and London Philharmonic Orchestra at The SSE Arena, Wembley. First released in 1993, Tim Burton's The Nightmare Before Christmas was directed by Henry Selick and based on a story and characters by Tim Burton. The film follows the earnest-but-misguided adventures of Jack Skellington, Halloween Town's beloved Pumpkin King, as he attempts to take over the Christmas holiday. Against the advice of Sally, a lonely rag doll who has feelings for him, Jack enlists three mischievous trick-or-treaters - Lock, Shock, and Barrel - to help him kidnap Santa Claus. Tim Burton’s fantastical tale was a box office smash which received rapturous reviews across the board has become a staple part of the extended holiday season.